The thermocline on Norfork Lake has been slowly dropping and currently is about 30 to maybe 35 feet down, and is holding most fish and bait species to this depth or shallower. If you plan to fish Norfork Lake take note of the thermocline level as lots of fish will hang at this level. Striped bass is the only species that I am aware of that will go way below the thermocline to reach cold water. 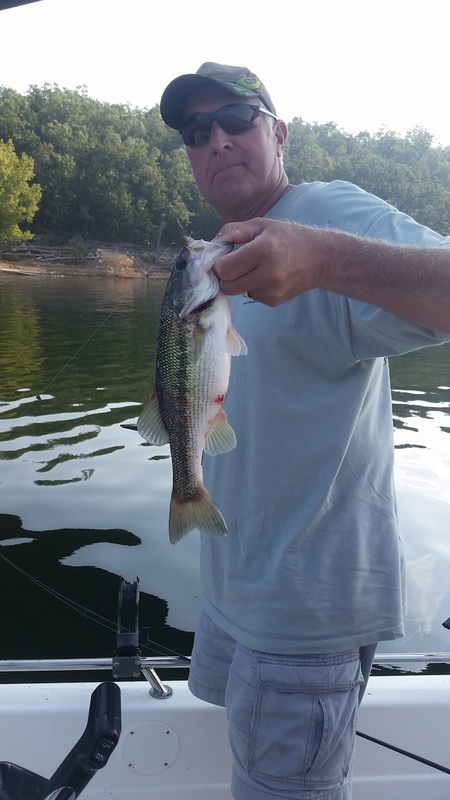 There has been some really nice spotted (Kentucky) bass caught over the last week. The bass are being found in two main areas; up in the flooded buck brush and suspended over deep water close to structure. 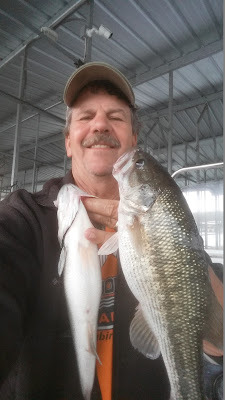 I went out bass fishing this morning and found some nice bass suspended down 10 - 20 feet in 60 - 100 feet of water. Bluff line points and the mid lake bridge columns are great places to check out. I also went out this evening for a few hours. There are plenty of bass feeding on shad up in the flooded buck brush. Top water baits, plastics and crank baits are all catching nice fish. 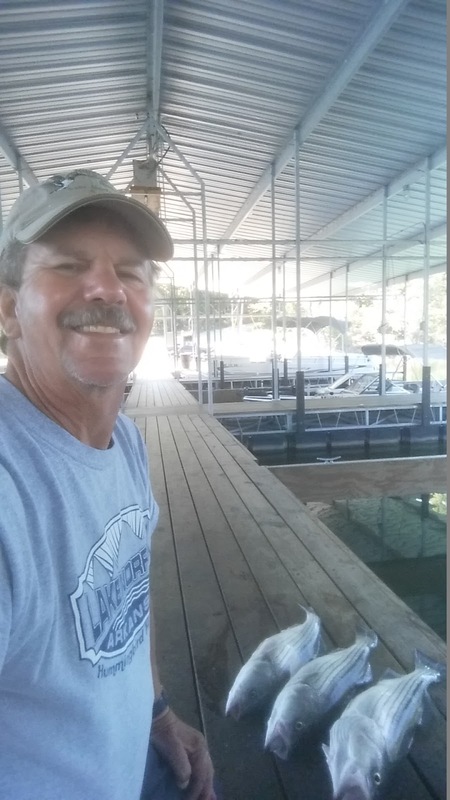 Live bait has also been doing very well in catching bass. This evening I found the white bass nursery. Norfork Lake had a great white bass spawn this year, if what I saw this evening is any indication. At first the whites were in about 16 feet of water on the bottom, but as the sun was lowering in the sky the whites started busting all over the lake chasing and feeding on tiny shad. Most of the whites that I found were small, but it was a blast catching one fish after another. I started out jigging a spoon on the bottom, but as the fish starting hitting the surface I switched to a Kastmaster. If this year is like prior years the big whites will start to show up very soon. Striped bass fishing has slowed, at least for me. I have been striper fishing only about 1 day a week. I was limiting out each time, until my last trip out on Labor Day. I found alot of fish down 80 - 90 feet on the bottom and some suspended in deeper water but I only got one light bite on my thread fin shad in a 2 hour period. The boat traffic over the holiday weekend may have affected the bite. 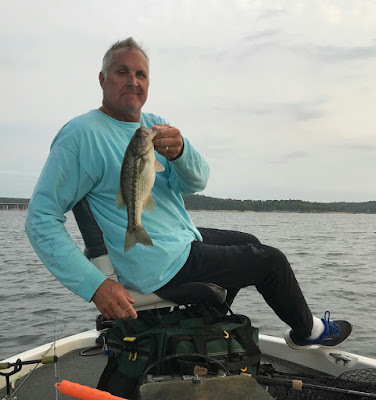 There has been a few stripers caught suspended down 30 feet over deep water in the dam area, as well as, in the mid lake area. Typically around mid September, the stripers in the dam area start to migrate north for cooler water. More and more stripers will show up in the mid lake area, as well as, up around the Missouri border. The upcoming cooler nights and days will help lower the water temperature which will benefit all species of fish. Norfork Lake level is falling about 3 - 4 inches per day with 1 generator being run continuously during the day and currently sits at 561.71. The surface water temperature this evening was 81.5 degrees. The main lake is clear with the creeks and coves stained.